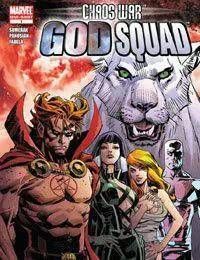 CHAOS KING has decimated the Pantheons of Earth, but the new GOD SQUAD have a last, desperate plan to halt Mikaboshis march towards oblivion! The Kami of Japan once trapped Chaos King in Yomi - the Japanese Underworld - but even with the God Squad's help, can his old pantheon put the genie back in the bottle? The gods themselves arent prepared for what they may find at the gates of Hell! Join the HELLSTORM, SILVER SURFER, SERSI, VENUS and more of Marvels most daring deities on an epic adventure thats sure to rock the heavens!